In the last episode of Radio Sai Study Circle, we discussed the Principle of Diversity elaborating on the reasons and causes for diversity, and the best ways to deal with them. Thanking profusely for the wonderful insights, Bhanu Sivakumar said it meant a lot for someone like him who lives almost half way around the world in New Zealand. Yet another encouraging mail was from Aruna Narayanan from San Jose, US. She says, “Oh, my God! How long have I had this unclear thought about unity in diversity…For long I have wanted to know whether having an ambition is wrong or is contentment right, not realizing that both can co-exist… Please accept my gratitude for the clear delivery of such concepts.” She also made a request for a study circle on the topic of love. We had a Radio Sai listener writing in from Chennai. Aarthi Krishnan heard about the programme even before it was aired on Radio Sai. Once she saw it lined up in the schedule, she eagerly downloaded it from the Radio Sai website. She was probably the first listener of the fourth episode. In this issue of H2H, we bring you the contents of the fifth study circle. As in the previous episodes, there are four alumni participating in this panel discussion, three of whom - Amey Deshpande (AD), Sai Giridhar (SG) and K. M. Ganesh (KM) - are research scholars in Bhagawan’s University. Bishu Prusty (BP), the fourth, serves at Radio Sai. It is moderated by Mr. G. S. Srirangarajan (GSS), also an alumnus, who is currently the Controller of Examinations in the same University. The moral of the story is: 'sarva karma bhagavat preethiyaartham', meaning, all our actions must be done as an offering to the Lord. The great violinist was not obsessed with numbers, nor was he anxious about his survival. All that he had in his mind was the talent that God had given him. In terms of making the violins, he wanted to make the best violin that was worthy of offering to the Lord who is the embodiment of perfection. And so, he just made one violin a year that really pleased the Lord. Today let us aim to focus on the main theme arising out of this story which is one should offer his or her work to the Lord. And, the prerequisite for this is the quest for excellence or in other words, a striving for perfection. We also see that Anthony was not obsessed with numbers. To him, as Swami always says, quality was more important than quantity. These are the two sub-themes that emerge from the story that lead to the main point of making every action an offering to the Lord. Let us start with the first sub theme: quest for excellence – and ask ourselves if we should really strive for excellence in all that we do? AD: The laziest man would say, "I am very, very happy just not doing any work. So why should I have this quest for excellence in the first place?" GSS: In fact most people regard work as a mere aspect of survival. Work is drudgery for such people and all they want to do is get rid of it, come back to their homes and have a nice time. So where does this whole idea of 'excellence in work' come in? BP: I do think there are a lot of people who strive for excellence. For that matter, I ask myself, "Why do I strive for excellence?" And, my answer to that is - because it gives me happiness. God has gifted each one of us with some abilities and potentialities. When we are able to translate these potentialities into an achievement of sorts, it gives us some level of satisfaction. And, if we come up with something that is of use to others in the society, then not only does it bring satisfaction but also a great sense of fulfillment. We also gain a meaning and purpose to our life. So yes, people want to excel because they are able to make some sense of their existence. It's almost like they want to create and define their life just like an artist does. GSS: Giridhar, what do you feel? Why should people strive for excellence in the first place? SG: I personally feel that when I strive for excellence, I grow from inside and in various other ways, and not just in the field in which I am trying to excel. For example, if I am playing cricket and trying to excel in the game as a batsman, it also improves my concentration, my ability to assess what the bowler would be thinking at that time and about how I can out-think him. So I think, in the very process of excellence, growth is a gift that each one is given. This is one primary motivation for me to strive for excellence. GSS: Ganesh, what do you think? KMG: I agree with both Giridhar and Bishu. When we strive for excellence we realize the potential God has given us. For instance, if you look at an uncut diamond, we know that it has a tremendous potential for brilliance. The beauty inherent in the diamond prompts us to develop its potential brilliance by chiseling it. Similarly when we strive for excellence in our work, our profession, or in developing a natural talent that God has given us, we merely touch upon that potential which is latent in us. The journey of realizing this potential in us I believe, is one of the most gratifying experiences of life. Hence it is imperative that we strive for excellence. BP: There is another point that often occurs to me. If you observe people in this world, there is one emotion common to every person and in fact, every being: it is this feeling of being wanted, of being loved. And when we excel, we are wanted, appreciated and loved. And I think, that is what propels us to do better and better. Ultimately, it is happiness but it is also about this feeling of being wanted. GSS: What do you feel, Amey? AD: I feel without this quest for excellence I would be reduced to a mere machine. As Giridhar pointed out, why do we need a bowler when you can have a bowling machine? In the game of cricket, you can have a machine to throw faster deliveries; we can even have a batting machine. But why don't we get the same kind of joy when we look at machines doing the job? It is because the fundamental nature of man is to aspire and achieve one level up; simply said, quest for excellence comes from the basic fact that we are not machines. GSS: When I think about why I strive for perfection in what I do, I believe it basically gives us a deep sense of inner satisfaction. Many a times, other people may or may not appreciate what we believe is excellence at work. But regardless of their opinion, it does give us a tremendous personal sense of satisfaction. Summing up all the points that we have just brought up - Bishu, according to you it's a source of happiness, fulfillment, and gives meaning and purpose in life. Work is not just work, it is much more than that. You also said, excellence makes people love you and appreciate you better. And then, as Giridhar said, it is personal growth and personal development. Ganesh talked about tapping the inner potential and as Amey put it, the key difference between a machine and a man is this striving for that limitless potential endowed in each one of us by God. Whatever the rationale, all of us agree that we need to strive for excellence or for perfection because that's what man is made about. BP: Coming back to what we started with, Ganesh said there are some people who do not strive for excellence and are happy with not doing anything. GSS: Bishu, I think that is just a temporary phenomenon. I have seen many such people who are at their lowest level of what we call the ‘Maslow's hierarchy’- striving for mere survival. But as they grow up this ladder, a point comes when they realize work is not just merely about work and start feeling hollow. And that's when they would like to offer their best. BP: Though they seem to be happy, there is actually a lot of emptiness in their heart. And sooner or later, this hollowness manifests itself. AD: I think once a person’s basic survival has been taken care of, it is always a matter of going that one step ahead. In that sense, even a person doing his work merely for survival is sometime going to take that one step ahead. Or perhaps a person should be so realized that he need not do action at all, which is also, in a way, excellence of the highest order. GSS: On the other hand, I have also seen people such as a vegetable vendor on the street who is possibly still struggling for basic existence, delivering wonderful service to the customer. He does that with a smile and so much of love. Perhaps, it’s all a question of attitude and can be done at every point of life. Steve Jobs delivering the commencement speech at Stanford. GSS: So how do we then get this excellence at work? How do we really strive for this perfection? That's the key point. He goes on to say that if you are dissatisfied with the answer that you are giving yourself on three or four consecutive days; if your answer is "No, I am not happy with what I am doing", then be sure that you are not excelling. Steve Jobs even jokingly says that if you keep asking yourself this question every day, one day you will eventually get it right, and that day might literally be your last day, so watch out. A constant retrospection and self-audit that we may have to keep doing is a good way of bringing out excellence. I think this is a very nice way to take stock of ourselves. BP: Amey, what you said brings home the fact that there is no shortcut to excellence. Hard work is a must for excellence. BP: But at times, there are people who we know work hard but do not excel. And, that is because it is not only important to do the right thing, it is even more important to do the thing right. And generally combining passion with hard work is sure to ensure some level of excellence. If we look at all the inventions and the discoveries in the world, if we examine the legends in history, all of this happened only because hard work was coupled with unbridled passion. We can have any number of examples to validate this. For instance, let’s look at Thomas Alva Edison. He has more than a thousand patents to his credit. His achievement did not come easy. His applications for patents were rejected countless number of times. And at that point in time, all he said was: "I have not failed. I have just found 10,000 ways that will not work." He did not consider his research as work because he was so passionate about it. Even if we take the case of Sachin Tendulkar, who is considered as God for cricket lovers; on his first tour, with his Mumbai state team, he was sharing a room with a coach, Mr. Kamat. This was in Hyderabad. That night in the hotel room, Kamat woke up to some familiar sounds. And, he saw his roommate walking to and fro speaking to his non-existent battle force. He was uttering all the typical cricket jargons used while running between the wickets like "Stop", "Stay back", "Run" and so on. He wondered what was happening until he realized that Sachin Tendulkar was sleep-walking. And, in his sleep, he was deeply immersed in cricket. That was the level of his commitment and passion for cricket. Actually at this point, I am reminded of what the former president of India Dr. Abdul Kalam says about dreams: "Dreams are not what you see when you sleep. 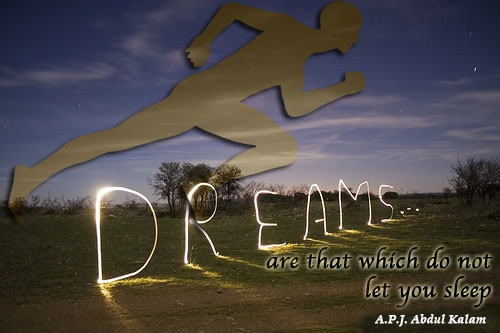 Dreams are that which do not allow you to sleep." That amount of passion coupled with hard work is a sure-shot way to achieve excellence. AD: I am also tempted to use two specific Japanese management terms here: Kaizen and Poka-Yoke. Prior to the 1900s, a product would be manufactured and tested for defects and if it had any, it had to be either discarded or sent back to the factory for rework. The Japanese looked at the whole thing in a very different way. They wondered: 'Why do I need the product to come out all the way and then check it for defects. Why not check it at every stage? In other words, can I do continuous improvement at every step of the process?' This strategy of continual improvement is called the Kaizen approach. If we apply this approach to our lives, it would yield amazing results. As Bhagavan says, "Can I look at every thought and ask 'Is this the right thought? Is this the right action? Is this the right word?' Such a process of continuous self-audit and introspection will undoubtedly result in excellence. In other words, excellence is not just a destination, but a process. KMG: Excellence is a continuous journey. GSS: Yes. Moving on to the other Japanese jargon, Poka-yoke - it basically means 'zero error'. That is, you make a process so perfect that you just cannot make an error. For example a simple thing as a pen drive and a USB port can be inserted in only one way. Imagine what if it was possible to insert it through both ends and then discover that it does not work. This is how the Japanese came out with this concept of 'zero error' wherein you design processes in such a way that what comes out is pure excellence. AD: The best part is these Japanese management concepts are so relevant to our own lives as well. SG: I think there is another aspect to this. Talking about the Japanese work culture, somehow it is embedded into them to work for the overall good of the nation. This seems to be one motivating factor that drives them to aim for excellence. For example, we have heard this story of a shoe company where there was a strike and yet the workers didn't stop working like in other places. They instead produced only one shoe of every shoe set pair - the left one. Obviously, these could not be sold, but at the same time they were not hampering growth or the productivity of the nation at large. Because as soon as the strike ended, they went ahead and produced the shoes for the right leg and immediately put the pair up for sale in the market. Now that’s a very innovative way to work even under negative circumstances. In 1990, a journal called ‘Quality Progress’ published a paper by one Mr. Dhillon detailing a few characteristics of the Japanese culture that inspires them to work the way they do. He says there is this concept called 'Giri' in their culture which means duty or obligation of an individual to others; this originates out of gratitude. The Great Kanto highway in Naka, Japan. It seems the Japanese prioritize satisfying others over their own individual satisfaction. This is one thing that motivates them to strive harder for their productivity. For that matter, even the recent earthquake and tsunami (in April 2011) came as a great revelation to most of us, didn’t it? For instance, the Great Kanto highway in Naka which was completely destroyed after this tragedy was rebuilt in a mere six days! AD: I think the photographs of this amazing work are also available. SG: Yes, the photographs clearly show the contrast of what the highway was prior to and after the restoration. Looking as it is now, you can't even make out that something of that magnitude had ever taken place there. Asian Tribute, one of the agencies that reported this news, goes on to say that while Japan is not the only place in the world with renowned engineers for performing this ingenious task, it just doesn't happen in other countries. GSS: Talking of excellence in perfection, I am reminded about Swami; He is the best example one could have of perfection. Ganesh, can you give us some examples from Swami's own life? KMG: I can quote several instances. For instance, simple acts such as being the last one to come out of the interview room after switching off the fan and lights to conserve electricity. One sign of living with excellence is also in the optimum utilisation of resources. Swami Himself says: "Don't waste food; don't waste energy; don't waste time." One may ask: 'What will one achieve by saving a few minutes of electricity?’ But Swami clearly demonstrates that the attitude of conserving is more important. And importantly, the one who is sensitive to the minutest of details has the ability to handle bigger things in life. In this context, I remember one occasion when Swami had instructed the boys to clean the auditorium, and said that He would personally come and inspect their work. Needless to say, the auditorium was literally combed. The floor was mopped, the seats were dusted both above and below, the window panes were washed and the stage was cleaned twice. When Bhagavan came and all the boys were eagerly waiting for His praise, He slowly glanced at a remote corner of the auditorium, and there, to everybody's consternation, was one cobweb! This proved yet again how even at the physical level nothing can escape Swami's eyes. Imagine how much more careful should we be when it comes to His omniscience! BP: It also shows Swami's penchant for perfection. Let me narrate what happened on the day of the inauguration of the Sri Sathya Sai Junior Boys Hostel. This was in 1995. That morning, Swami cut the ribbon and there was plenty of activity going on around Him - the inauguration function, the bhajans, the vedam procession, elders offering flowers to Swami and so on. Once Swami stepped in, He turned left and His eyes fell on the staircase that leads to the second floor of the building. Swami called one of the teachers standing there and said: "Do you notice the railing on the staircase? It starts from the second step. When the boys return from school in a hurry, this railing is going to hurt them. You should therefore pull the railing to the last step." Yes, Swami has an eye for detail but this acquires a new dimension when you think of Him noticing this during the inauguration function when there is so much going on around Him. If you look at it, why does Swami have to do this? It's His concern for us, it's His Love. Perfection in Swami comes from the Love He has for all of us. SG: Swami looks for perfection in the smallest of things. For example, every drama the students put up, Swami always comes first into the Bhajan Hall and goes around to take a look at the students to see how their makeup has been done and whether they are absolutely ready in their costumes, and so on. He then goes outside and calls for the students as though He has just arrived and is waiting for the programme to commence. He does not show any indication that the entire arrangement has actually been overseen by Him personally. I am reminded of one such instance when we put up a drama called 'Sri Krishna Raya Baram', where the make-up of one of the brothers who played the role of Krishna was slightly overdone. The shade of blue was a bit darker than it should have been. Swami immediately noticed it, called him and said: "I will give you some time, and by the time I go outside and sit somehow you must reduce this shade - it is too dark for Krishna." Bhagawan posing with the actor after the drama 'Krishna Raya Baram"
AD: Obviously, only He can know! SG: Yes. Only He knows His skin tone. He called the make-up boy and said: "See, this should be lightened before he comes onto the stage." And then Swami gave us ample time to ensure that this job was done. AD: I would like to share an extremely beautiful experience that was narrated to us by Mr. Venkatachalam. SG: Who is in charge of the kitchen in our senior boys' hostel? AD: Yes, and he has been around for the past 30 years, since 1979. He mentioned that when the senior boys’ hostel was being constructed, Swami used to come and spend a lot of time looking at every minor detail. To see Swami standing there for so long, overseeing the whole activity, used to be very painful for everybody. So one day Mr. Venkatachalam summoned the courage to go and tell Bhagavan: "You are spending so much time here, there is no need for it. We can take care of everything." In his own humble way, he was telling Swami not to strain Himself and assured Him that the work would be done well. To that, Swami replied: "No, no. You cannot do that." But Mr. Venkatachalam insisted: "No Swami, we can do it." So Swami said: "Okay. I will go from here. By tomorrow morning, three things in that room should be done. The furniture work, the electrical work and the painting work." Then Swami asked him: "Can you ensure these?" He said: "Swami, all that is almost over. Yes, it is definitely possible." GSS: Obviously, he didn't know what he was getting into! SG: Swami left for the day. As promised to Bhagawan, Mr. Venkatachalam stood there personally and supervised the work. The next day, at about nine in the morning (the exact time that Swami had indicated), His car came near the hostel and even before He could get down, Swami asked him: "Are you sure everything is done?" His question almost sounded like a warning. Mr. Venkatachalam was absolutely confident, so he said: "Swami, everything is done; whatever You asked is ready." Mr. Venkatachalam (second from right) at His service in the hostel kitchen. Bhagavan then got down and in His usual way said: "Hmmm..." as if meaning...'Let me now begin My work'. He went inside and pointing to a cupboard, said, "Okay, open this". In the hostel, our cupboards have a three-tiered structure. Two are closed by a pair of vertical doors, and the third has a horizontal door which when open becomes a study table. So Swami said: "Open the study table and show Me." He did that. There was nothing wrong with it, but it so happened that the study table was not exactly parallel to the ground; it was missing by a few degrees. Swami was obviously annoyed. He said: "Look, if you are going to construct like this, how are the boys going to sit and study? They will get back ache and neck pain." It was amazing how Swami came up with all these minute things, and then He said: "You have failed in furniture work. One out of three is gone. Have you at least done the electric work properly?" Now Mr. Venkatachalam was not as confident. He said: "I think so Swami, I am pretty sure electric work is done well." Then Swami just looked up and there was a live wire hanging right on top of His head. Swami asked: "So what is that?" Mr. Venkatachalam was now at his wits' end. He said: "Swami, I am so sorry." Bhagawan then gave him a piece of His mind again. Finally, He said: "You have not passed in two out of three." Finally He asked: "At least, have you done the painting work right?" By now, Mr. Venkatachalam Sir was completely nervous. He said: "Swami, I have no idea." And unbelievably, Bhagavan went and checked one of the window stoppers (small wooden blocks on the back of the window to stop it from banging). He removed the stopper and checked its rear side to see if it had been painted. Obviously, it wasn’t and so Mr. Venkatachalam got another strong reprimand. So that is the kind of excellence that Bhagavan works with and expects from each one of us. GSS: That was an amazing experience. Basically what we see here is that excellence is not what the other person is looking for. Whether the back of the window stopper had been painted or not is something that perhaps no student would have bothered to notice, but it is the attitude towards work and action. 'I am doing it for God and God is perfect' – this is the feeling that Swami wants us to endorse. I will actually like to conclude this sub-theme with another very striking story of a sculptor. Here's a man who sees an artist who has carved out a very beautiful statue that is more than six feet in height. And, there was another very beautiful looking idol placed on the ground. The man asks the sculptor: "Are you making one more idol of the same type?" 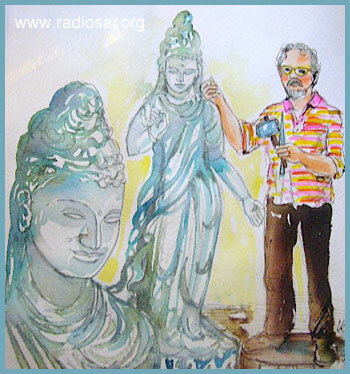 The artist replies: "There is a defect in that statue, so I am making one more." The man was struck with this because what he saw before him was a very beautiful piece of artwork and he wondered where the problem was. The sculptor said: "Look at the nose; there's a small scratch just below the nose." So the man goes and peers at the nose but fails to see the small scratch. The man then asks the sculptor: "Where will you be erecting this?" The artist replies: "On top of the hill." The man then laughs and says: "First of all, this statue is so tall. And you are going to erect it on top of the hill. Hey sculptor! Tell me, who in the world will observe that small scratch under the nose?" And the sculptor says, "I can." This is what Swami is trying to teach us; God has made us perfect. As He said in the story, you are a part of God and God is perfect and so you have to be perfect. This is indeed a beautiful lesson for all of us.